By Michaela Ecklund (Claremont McKenna College) and Michelle Lam (Claremont McKenna College) [Edited by Lars Schmitz, as part of BIOL 167 “Sensory Evolution”, an upper division class at the W.M. Keck Science Department. Written for educational purposes only]. What do you think about when you think of the “sense of touch”? Touch is one of the most important senses in living organisms. This specialized form of mechanosensation leads to the perception of tactile stimuli to the body and allows for organisms to perceive the world around them. Now, try to imagine a world in which humans walked on all fours and could only rely on tactile and olfactory cues to navigate. This is the world of the inconspicuous naked mole rat. To make up for their near blindness, these mammals rely on sharp hearing, an acute sense of smell, and tactile information from their incisors. Teeth are commonly used for cutting, stabbing, chewing, and mastication. In a research study published in the journal Frontiers in Neuroanatomy, Sarko et al. (2013) show that teeth are not simply hard structures used for alimentary processes and as weapons of attack or defense, they are much more! 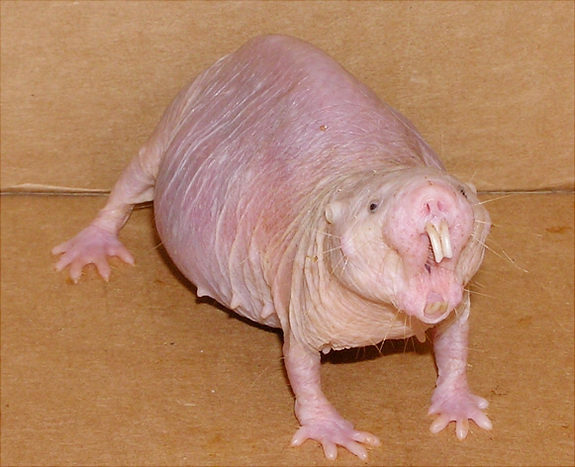 Naked mole rats utilize their incisors for exploring their environment, excavating tunnels, carrying and eating food, transporting young, and grooming. Furthermore, their incisors are used in competition for resources, colony defense, and interspecies competition, otherwise known as “incisor fencing”. What makes these incisors special is that they are moved independently and voluntarily. The movement of the lower incisors is analogous to the movement of fingers as they are both involved in grasp and touch. The cerebellum plays a major role in this ability as it is traditionally involved in motor functions. In this study, they have shown that the cerebellum is also associated with sensory and cognitive tasks. Tactile inputs were investigated using multiunit electrophysiological recordings of cutaneous (skin) and periodontal (gum) responses received by the cerebellum. In other words, electrodes were used to measure and record neuronal activity within the brain. Based on these somatosensory responses, the lower incisors and whiskers had prominent representations in the cerebellum region of the brain. Surprisingly, this electrophysiological mapping of responses displayed that periodontal inputs are received by all lobules of the cerebellum except for the uvula, i.e. a small lobule of the cerebellum lying on the inferior surface of the vermis. These findings confirm previous knowledge (Catania and Remple, 2002; Remple et al., 2003) that naked mole rats have dedicated a large cortical area to reception of periodontal stimuli. To put this into perspective, the somatosensory cortex in rats is only dedicated to 7% of the inputs from the incisors, whereas that of the naked mole rat is 30%. Known as the longest living rodent and immune to cancer, these mammals are truly astonishing! In addition to their highly sensitive incisors, their brain organization is both extraordinary and unique. Through evolution, the region of the brain that is normally devoted to vision now acts as a somatosensory receiver. The results of the study performed by Sarko et al. (2013) highlight the diverse sensory specializations and corresponding brain organizational schemes that have evolved in different mammals to facilitate exploration of and interaction with their environment. Although this study broadened our knowledge of the mechanosensory system within naked mole rats, future studies are needed to help us further understand the mechanisms behind this system and as to why the vibrissae and lower incisors are the most sensitive body regions of the naked mole rat. This could be done by mapping receptive fields in the lips, molars, tongue, and gums. Overall, this goes to show that sense of touch, including information from the teeth, is of critical importance to survival. Just remember: If you’ve ever wondered what a real life super hero looks like…it looks like a ball sac. This entry was posted in mechanosensation, sensory evolution blogs and tagged incisors, naked mole rat, touch. Bookmark the permalink.